Las Vegas was built on chances and challenges — from everyday people taking a chance on a slot machine to casinos taking chances on entertainers. It’s also a place that caters to a wide variety of entertainment tastes, often changing with fads of the day without much in the way of permanence for performers. So any show that survives all of that in the ever-changing climate has to have something going for it in the first place. Years ago, the Mirage took a chance on what was known in show biz terms as a “novelty” act. 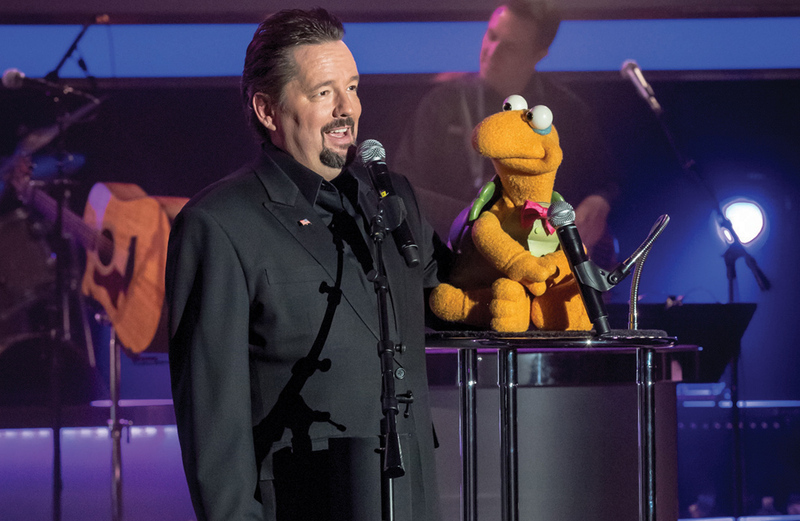 They turned their showroom over to ventriloquist Terry Fator and his puppets. They saw how big he became after winning “America’s Got Talent,” but even given that talent show success, it would seem a tough sell for an entertainment director to tell casino bosses they just had to give a ventriloquist his own theater, especially when he had been plying the county and state fair circuit not that long before finding his niche as a puppet master. Whoever thought of booking Fator was right on the mark. His combination of ventriloquism, comedy and singing impressions was a truly feel-good show in a town based on being entertained. He quickly became a “must see” Vegas act, so much so, his show won four top spots in the 2013 Las Vegas Review Journal’s Best of Las Vegas Awards — “Best Show,” “Best All Around Performer,” “Best Impersonator” and “Best Overall Show.” The novelty of his show hasn’t tarnished one bit and it continues to be one of the must-see shows on The Strip. Fator came to Laughlin in 2008, just after signing his mega deal with the Mirage. He was a guy who could barely believe how his life had changed in just a few short months after years of struggling to make it. He still had stars in his eyes and was just thrilled to be working. We talked to him then and just about every time he’s been here since, and one thing that hasn’t changed — he is always as nice as can be. How is the show going in Vegas? It is very good — it’s absolutely about as good as it could possibly get. You and Winston seem to be holding your own on an entertainment landscape that changes all the time. We are. We’re just happy. I think a lot of that is that I just keep changing my show. I’m always writing and rewriting, creating new characters, and coming up with new ideas and routines, and impressions. People come to see me year after year after year and they never see the same show twice — and that is how you keep a show with longevity, if you want to do that. Do you think it’s interesting a puppet show continues to be a popular draw in Vegas? Yeah, it’s pretty amazing. The funny thing is, I’m so focused on my show and writing that when people say, “Doesn’t it concern you? Obviously you’ve been a success, you know, a lot of people have failed in Vegas, aren’t you worried?” I never had time to worry. I’m so focused on my show, and doing it and making sure everything is new and fresh, I’m always pushing myself creatively to be the best I can that I just don’t have time to worry. Well that’s probably the best way to go about it. Worrying about other shows could make a person crazy. Exactly. You sure can, as long as you continue to focus and think about what you’re doing, and as long as you don’t have time to worry and think about other things, just focus on the task at hand. Then suddenly, kaboom, it’s 10 years later. Yes, my 10th anniversary at The Mirage comes in about a month and a half. It doesn’t seem like that long. It’s really incredible. The thing about what you do defies explanation. But your puppets get away with saying things you would not. How do you explain it? Yeah, they do get away with a lot and it’s wonderful. As long as I keep things fresh and new and have new ideas, I really feel like my audiences are going to continue coming to see the show. I’m constantly writing new material, I just wrote a couple of new jokes about things that are in the news nowadays. It’s just what I do. People talk about the fact that my show is very relevant in what you see in the news, so I’m going to have jokes about what you’re seeing in the news. I try to keep that up. Are you touring the country as well? Oh, yeah, I’m constantly touring. I just performed in Windover, Nevada, before that I was in Florida. I love work, I love to perform, and as long as I continue to do my job, and enjoy my job — not just do it, but enjoy my job — I’m gonna keep doing it, man, I love it. What’s new with the show you’re bringing back to Laughlin this trip? I have at least one new puppet, there may be more than that. I added several characters to the show, and I can’t remember if it was before or after I played Laughlin. But there’s a lot of new material, a lot of new things, so even if people came and saw the show last year, it’ll be a different experience. Are any of your characters patterned after yourself? No (he laughs). I let myself be myself. And obviously, I’m a comedian because of my puppets, ’cause I write comedy and stuff, but I don’t really look at myself as the comedian on stage. I write the material, and I’m having my puppets be the comedians, I always play the straight man. So I get to be that person, who’s if there’s ever a punch line or a joke, it goes to the puppet. You are way too giving. I’m perfectly OK with them getting all the credit. Does Winston like or dislike any of the other characters? Do they have creative differences? They all get along just perfectly. It’s amazing, I put ’em all in the same box, and I never hear a peep out of them until I want to. And the second I do hear a peep out of them when I don’t want to, that’s when I’m checking myself into the nearest hospital. What do you like about performing in Laughlin? Do you think you’re living the dream or is it better than you thought? Oh, it’s way better than I thought. I surpassed my dreams way back about 10 years ago. I’m not disappointed, holy moly — my dream was to make it easier to get booked. I mean, I wanted to have a Vegas show, but my dream was to start off The Strip. I was gonna build my way up, and in 10 or 15 years, after starting that, just maybe I might be able to get a residency. Then it went kaboom as soon as I won “America’s Got Talent.” I got an offer to perform for a year for just three days a month at the Las Vegas Hilton, then one year after that, The Mirage decided to make me their main resident headliner. It went so fast, and, of course, I never dreamed that it would happen so fast and it would be as big as it is. I saw where Wayne Newton is celebrating 60 years in Vegas. Do you have a Wayne Newton puppet yet? I don’t, honestly I’ve never thought about it. But that’s quite an interesting idea to have a Wayne Newton puppet. That would be fascinating. He’s a Vegas legend. I’m sure we could come up with some very funny material about his time in Vegas. New projects in the works? I’m working on some television projects, and that should be coming down the pike. I’m going in regularly two or three times a week, along with my Vegas show here at the Mirage, and I’m flying to and from Hollywood talking with television producers and other producers about getting some television projects. So we’ll see what happens with that. Just make sure people know they can come out and see a lot of new stuff and the energy is always so much fun, and so wonderful and positive. You’ll leave my show feeling like a million bucks. I just make sure the energy is always upbeat and fun. I’m still just me, and I keep myself grounded by just remembering that God loves all of us equally and he doesn’t play favorites with any of us. I’m just like everybody else. I look forward to coming down there.